Ever since Mahindra first launched the XUV 500 in September 2011; it managed to create an almost cult-like following for the vehicle. It immediately became the darling of the aspirational middle-class who seemingly wanted an SUV with loads of creature comforts and modern features, and all that at an attractive price. Today the picture is rather different, The consumer is just as aspirational, and just as demanding, but is more spoilt for choice, and therefore more pampered. So, despite having sold over 100,000 of them, the challenge for M&M was to really make the XUV 500 even more relevant. The answer is the new facelifted car we see with us today. It is certainly a facelift in the cosmetic sense. But right up front let me tell you the good news - it is also an upgrade on the mechanical side. The car had certain glaring chinks in its armour, which have been addressed - for the most part anyway. The biggest difference is how the vehicle's ride quality has changed. Despite being a monocoque construction - the chassis always seemed to convey a sense of roll and bounce usually associated with ladder-on-frame builds. The suspension setup has been changed to now cater to a sportier ride feel, along with specific focus on high-speed capability. While the ride has got sportier, it is by no means stiff, and so Indian buyers will still find it comfortable. The vehicles' ESP (Electronic Stability Programme) system supplied by Bosch has been upgraded (by the supplier). The new ESP 9 system now offers more precise cornering and better lane-keeping capability at high speeds. The car also has brake energy regeneration that feeds power to the battery. The engine output numbers remain unchanged, though the 2.2 mHawk never had a problem, did it? So you still get 140 horses and 330 Nm of torque. Mileage, though, is up from 15 to 16 km/l. Now to the makeover. The original design was quite a hit with buyers, but was still criticised by many as being overstyled. That theme continues, though a black treatment on the headlamps and front grille help make the car look more upmarket and tones things down somewhat. But just as you absorb that, you are hit by a flash of chrome from the inserts that surround the fog lights. Had this been avoided the rest of the face would've been much more attractive in my view. But very often my aversion for chrome has been slapped by the consumer's total acceptance - so I will accept that many will love this! I do like the big muscle added to the hood on both sides, rising and blending into the flared fenders and wheel arches. Very nice - especially when you're driving - and see that muscular bulge on either side of the hood - it gives you a great sense of power. The new headlamp is very well designed, and houses new projector bending lights. It looks sophisticated, with plenty of quality and design detail shining through. Inexplicably Mahindra has stuck to the old SUV's (and new Scorpio's) attribute of having a nice LED design feature in the cluster - but using it as a parking light instead of a DRL (daytime running light). Adding a DRL to the XUV would've given it a higher-end appeal, and a signature worth establishing. Oh well - I've been promised by the guys at M&M that the next generation cars will indeed house DRLs so I will await those! There is chrome that runs along the windowsill line that's also new. But most of these features will likely be offered ion the higher spec variants. Speaking of which, there is now an all-new W10 variant on the car. This has a sunroof and 17" alloy wheels that Mahindra says was feedback it got from buyers of this car. The existing 3 variants W4, W6 and W8 will stay on - though all carry the basic styling and all mechanical changes. All-Wheel-Drive will be optional on the W8 and W10. The door handles are also slightly restyled, and the car also projects its name on the ground from the outside mirrors now - though you can only appreciate that after dark. Inside the car seems much better finished. Interestingly Mahindra says the grade of plastic and materials used remains the same. Yet I got a sense of much better finish and quality - and that's simply because the dash now does away with the pronounced wood grain texture, and is now simply textured. The colour palette is also more like what you saw on the Scorpio - smarter two-tone, though not as fresh and stark as on the Scorpio. There is now a start-stop button, and the infotainment touchscreen has grown an inch to 7". The theme is now blue (unlike the earlier red) - on the touchscreen graphics, the instrument cluster and the car's ambient lighting. Oh I'm sorry - icy blue - as M&M says! You can now add your own wallpaper to the touch screen for a personal feel! There is also a reverse camera thrown in besides the earlier parking sensors. The maps on the navigation have also been updated according to Mahindra. Aluminium finish pedals and an electrically adjustable power seat for the driver round things off. Though again I reiterate some of the fancy add-ons are going to be restricted to the new W10. And now the best part. 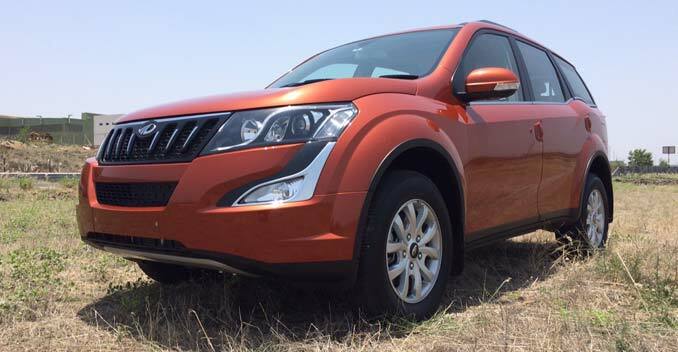 Mahindra has tried very hard to keep prices for the XUV 500 largely unchanged. This makes the proposition more attractive, since most vehicles add a few thousands at least when they step out of the facelift factory. I would have liked to see Mahindra offer an automatic variant right from word go on the upgrade. That is a miss, because there is potential there to capture a growing demand for an auto box. But Mahindra engineers I spoke to promise me that a modern and capable automatic gearbox is coming our way very soon. I expect that variant to debut around the festive season, or at most the Delhi Auto Expo in February next year.